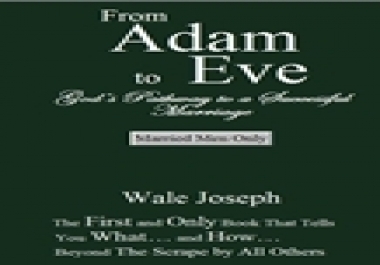 Take that giant stride now, download a copy of…, “From Adam to Eve …God’s Pathway to a Successful Marriage,” for a guide that’ll last you a life time. You’d be placing yourself right on no other but God’s Pathway… to a Successful Marriage. …the first and only book that tells you – beyond the scrape by all others - what… and how to; 1. Maximize partner’s reciprocal pleasure. 2. Conform to social and religious perspectives. 3. Attempt what’s scientifically explicable. 4. Avoid further health risks. 5. Eliminate concern for a large body or genital size. 6. Avoid a strenuous bed top exercise and… 7. Succeed in your marriage… at no cost. I will help you advertise your services by spreading them to 10,000 email addresses for the price of 5 dollars.